Comrades! For too long imperialist pigs of West have luxuriated in capitalist drum machines, built on blood of oppression and stained with sweat of poverty, while laughing up sleeves at inferior Soviet Socialist drum machines. No longer! Loyal Soviet scientists working in Party laboratories now reveal to you magnificent Lel PSR, glorious triumph of superior Soviet engineering. Unlike decadent so-called "doctors rhythm" and other Western indulgences, Lel is built like a tank. So it should be! It is built in same factory as tank! 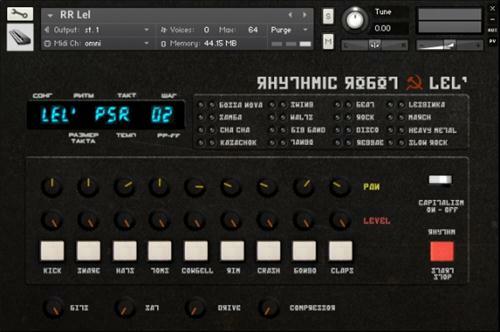 Not only Lel has 8-bit drum sounds, but also 16 onboard preset rhythms. Party leaders told scientists at Lel fabrication plant to gather 16 best rhythms from all of Mother Russia and our United Soviet Socialist Allies. Result is 16 awe-inspiring rhythms from both decadent West (Rock, Heavy Metal, Reggae!) and also from Motherland herself: authentic Russian rhythms for sword-dance, vodka festival, Red Army Missile Corps march-past and more. You look for American drum machine with Kazachok rhythm or Lezginka rhythm. You look in vain! And more that this, our proud Soviet scientists also include rhythm variation for each style. That is right, Comrades! Thirty-two rhythms for less than price of used tractor! Sadly, recent need to concentrate manufacturing goals on long-term supply of nuclear warheads and tank-tracks has meant Lel units now in short supply among loyal Communist beat-combo musicians. With tears of great joy, then, we bring news that loyal Comrade Brothers at Rhythmic Robot Collective now create Lel unit in virtual factory, utilising virtual comrade workers, to greater glory of Mother Russia! Virtual Lel captures every detail of original Lel, using 24 puny capitalist bits to do job of original 8 communist bits. Not only are all 32 preset Lel rhythms restored to rightful places, but also can be automatically locked to timing of capitalist DAW in unprecedented example of glasnost, and even combined to form unheard-of new beats. All Lel kit pieces including Party Leader favourite, "cowbell", mapped to keyboard, with velocity determining if kit pieces Accented or not. No! Not Accented like drawling, spittle-dribbling Americans with laughable comedy Noooooo Yawwwwwk accents! Accented to greater glory of Motherland! Use velocity control and see! Additional control for level and pan now built in for every loyal Soviet kit piece. All original panel legending preserved according to true principles of Maxism-Leninism. But for pathetic effeminate Western lackeys who do not speak Russian tongue, panel also provided with Capitalism On-Off control, for translation. Use it if you are weak! Rhythmic Robot Audio Lel KONTAKT download links are externally hosted on Extabit, Rapidshare, Rapidgator, Netload, Uploaded and Rhythmic Robot Audio Lel KONTAKT also available directly on Torrent Sources.